All self-published shawl or stole patterns with errata are listed below in alphabetical order. 09/29/15: Corrected references to MC and CC. 04/18/16: Added symbols for sssk and k3tog to stitch key. 10/2/17: Written directions Row 31 both scarf and stole: M1R should be M1. Correction to key: Symbol for purl should be defined as RS purl, WS knit. Corrected legend for 2/2 ribbed cables (had read 2/1). 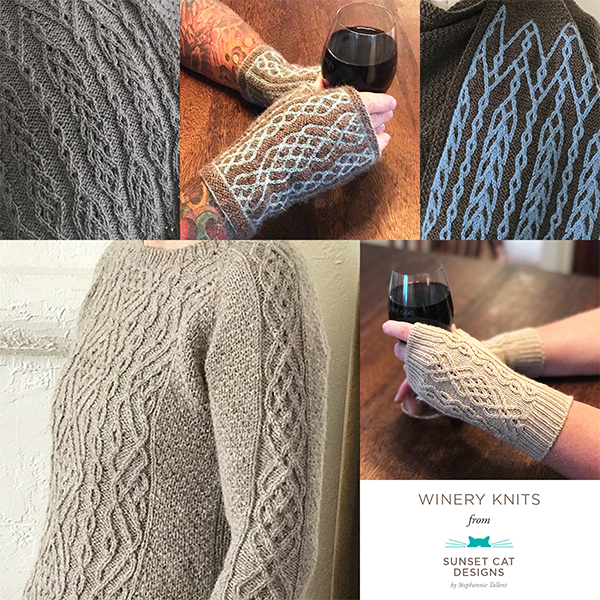 If you have the original e-book or pattern from Knit Picks and find errata, please contact Knit Picks as well — they are the keepers of the main pattern. 2/2 LC missing from key: Sl 2 sts to CN, hold in front. K2, K2 from CN. Rows 2, 18, 34: Sts 10 and 80 should have the purl symbol (knit on the WS). Rows 11, 27: Sts 14 and 77 should have the purl symbol. Row 28: Sts 47 and 44 should have the purl symbol. Row 38: Sts 40 and 71 should have the purl symbol. Rows 9 and 25, stitch columns 23-24: Should be 1/1 RC. Rows 9 and 25, stitch columns 67-68: Should be 1/1 LC. 2/9/16: Crochet bind off correction to written (chart notes are correct). Should read: Sc in 1st stitch, ch7, start repeat sc3tog, ch9, (sc5tog, ch9) three times twice, sc3tog, ch9 twice, rep from start repeat to last 40 stitches (last flower), sc3tog, ch9, (sc5tog, ch9) three times twice, sc3tog, ch9, ch7, sc in last stitch. 2/25/2016: Pattern revised to include an additional (smaller) size, in-depth swatching instructions, etc. Please contact the store from which you purchased your kit or the pattern for the update, or download it here. You’ll still need the original pattern for the charts and keys. 2/19/16: Work repeat 27 (35) times. 4/2/2018: Line by Line instructions had LC, RC, LCp and RCp rather than LCT, RCT, LCPT and RCPT. 01/21/16: Pink overset text on charts removed.